In Russian folk lore, there are many stories of Baba Yaga. Sometimes she is shown as a kind old woman, but usually the Baba Yaga is wicked. An old, ugly crone, she is emaciated like a skeleton. Sometimes she is called Baba-Yaga Bony Leg. Her nose and teeth are long and sharp. She has iron teeth for eating children. Russian parents tell their children that Baba Yaga eats only children who misbehave. Other common elements of a Baba Yaga story are that she is usually shown living in the forest, riding in a mortar, rowing herself along with a pestle and brushing her traces away with a broom. Her hut stands on hens legs, in some stories two and other stories four, which allow the hut to move about. The fence and gates of her house are built of human bones, along the top of which are stuck human skulls with glaring eyes. Though Baba Yaga is Russian, elements of the Baba Yaga stories can found in folklore from other parts of the world. Adapted by Amy Friedman COPYRIGHT 1995 UNIVERSAL PRESS SYNDICATE Once upon a time in Russia a little girl sat in a shed weeping. Her father had married a cruel stepmother, and all the little girl's happiness had vanished. Suddenly the little girl noticed a little gray mouse scamper out of a hole in the wall. When he saw the little girl, he he sat up on his hind legs, curled his tail and wiggled his whiskers. He looked so skinny that the little girl at once forgot her own sorrows and offered him the dry bread her stepmother had given her to eat. He nibbled until it was gone and then looked up at her with twinkling eyes. "Thank you," he squeaked. "You are a kind little girl. Now I must help you. Listen carefully. The woman in your house is the sister of Baba Yaga, the bony-legged witch with iron teeth who eats children. If that woman ever sends you to visit your aunt, you must tell me at once." Just then the little girl heard her stepmother calling to her. "Come clean up the tea things and tidy the house!" The little girl ran to the cottage and saw that her stepmother had long bony legs and iron teeth, just like Baba Yaga. The next morning the little girl's father went off to visit friends. As soon as he was out of sight, the stepmother called to the little girl. "Today you will visit your aunt in the forest to ask her for a needle and thread to mend your father's shirt." Then she gnashed her teeth and her eyes flashed angrily. "Follow your nose, and you will find her. Off with you!" And she handed her a bundle wrapped in a towel. "Here's some food to eat on your way." The little girl wanted to tell the mouse that she was going to see Baba Yaga, but her stepmother was staring at her from the doorway. She had to walk straight ahead into the forest. Suddenly she heard a scratching sound under a fallen tree. Out jumped the mouse. "Oh, mouse," cried the little girl, "What shall I do?" "Remember to collect all the things you find in the road, and then you will be safe," said the little mouse. "Thank you," said the little girl. "Now let me give you something to eat." She unwrapped her towel, but inside she found only stones. "I have nothing for you to eat," the little girl said sadly. But the little mouse wiggled his whiskers and the stones turned to fresh bread and jam. The little girl and the mouse ate until they were full, and then they said farewell. As the little girl was running through the forest, she found a handkerchief. Remembering the mouse's words, she picked it up. Next she found a bottle of oil, and then some scraps of meat, and finally a loaf of bread. These she also gathered. 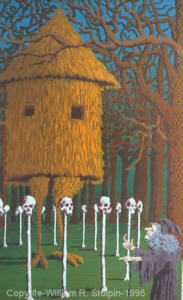 After a while the little girl came to Baba Yaga's hut, which was surrounded by a fence made from bones and skulls. When she pushed open the gate, she heard a squeaking sound. "It is lucky I picked up some oil," she said to the gate, and poured the oil on the rusty hinges. Inside the fence, Baba Yaga's servant stood wailing in the yard. "I have so many tasks to do!" she cried. "Here's a nice soft handkerchief," said the kind little girl. As the servant wiped her eyes, the little girl heard a growl coming from a scrawny dog that lay in the yard, gnawing a piece of bread crust. The little girl tossed her fresh bread to the dog. "Here -- you look so hungry," she said, and the dog gobbled it up and wagged his tail. The little girl walked bravely to the door and knocked. "Come in," called Baba Yaga. There she sat at a loom, bony-legged, iron-toothed, with flashing eyes. In the corner sat a thin black cat staring hard at a hole in the wall. "Good day, Auntie," said the little girl. "My stepmother has sent me to fetch a needle and thread." "Very well," said Baba Yaga. "Sit down here at the loom and continue my weaving. I will fetch you a needle and thread." The little girl sat down and began to weave. Baba Yaga left the room and called to her servant. "Boil water for a bath. I want you to scrub my niece all clean. I intend to make a fine meal of her." The servant ran off to her work. "Are you weaving, my pretty girl?" called Baba Yaga from the other room. "Yes I am, Auntie," the little girl answered. Then the little girl looked at the black cat and asked, "What are you doing?" "I'm watching for a mouse," said the cat. "I haven't had a meal for three days." The little girl threw the scraps of meat to the scrawny black cat. The cat ate them up and purred contentedly. Just then Baba Yaga appeared at the window. "Are you weaving, little niece?" she asked. "I am," said the little girl. And Baba Yaga went away again. Now the cat looked up at the little girl and said: "You have a comb in your hair. You have a towel. Take them and run for it while Baba Yaga is outside. When you hear her close behind you, throw away the towel. And when she comes close again, throw away your comb." The little girl shook her head. "I'm afraid she'll hear the loom stop," she said. "I'll take care of that," said the cat. He leaped across the room and took the little girl's place at the loom. He began to weave. The little girl dashed out of the hut and toward the gate. When she reached the dog, he looked at her closely. "You are the little girl who gave me bread," he said, and lay down and put his head between his paws. When she came to the gate, it opened without a single squeak. Off she ran. Oh, how she ran! And all the while the black cat sat at the loom, clickety-clack, clickety-clack -- but you've never seen such a tangle as the black cat made! When Baba Yaga returned to the room, she saw the cat weaving amid the tangled threads. "Why didn't you stop my niece from running off?" she snarled. Seeing the servant pouring water into the bath with a sieve, Baba Yaga raged. "The bath should have been ready long ago!" When she saw the dog sleeping quietly, she cried, "You were supposed to tear her to pieces!" And when she came to the gate, she hissed, "How could you let her go without alerting me?" The gate sighed and said: "In all the years we have served you, Baba Yaga, you never even eased my pain with water. The little girl was kind and gave me oil." The dog growled at her: "In all the years I've served you, Baba Yaga, you fed me only crusts. The kind little girl gave me a soft loaf of bread." And the servant girl looked angrily at Baba Yaga. "In all the years I've served you, Baba Yaga, you never even offered me a rag. The little girl gave me a pretty handkerchief to wipe away my tears." Baba Yaga gnashed her iron teeth. "I'll catch her myself," and with that she jumped into her mortar. Taking pestle and broom in hand, she spurred on the mortar. Meanwhile, the little girl remembered the cat's words. Stopping to put her ear to the ground, she heard Baba Yaga beating her mortar. "She must be close," said the little girl, and threw her towel behind her. At once the towel turned into a raging river. Baba Yaga came to the river and rode right in, but the mortar and pestle could not sail or swim. Baba Yaga cursed and shouted, but it was no use. She flew back home and gathered her cattle together. Then she sat in her mortar and drove the cattle as fast as she could, all the way to river's edge. "Drink!" she cried to the cattle. The cattle drank the river dry. Baba Yaga drove on in her mortar, bangety, bangety bang. When the little girl heard her coming, she threw down her comb. In an instant the comb grew and became a forest so thick Baba Yaga could not pass through it. Baba Yaga stopped at the edge of the forest and screamed, for there was nothing left for her to do. The little girl ran all the way home and told her father everything that had happened. When he heard about Baba Yaga, he was furious. "Did you send my daughter to be eaten by the terrible Baba Yaga?" he asked his wife. But before she could answer, he saw how she flashed her eyes and gnashed her iron teeth. "Go away!" he said to the woman. "You have lied to me and tried to harm my child." Seeing all was lost, the stepmother went angrily away. The little mouse moved in with the kind little girl and her father. All was happy once again in the little cottage at the edge of the forest. Baba Yaga is sort of the Russian equivalent of the Fairy Godmother and Freddie Kruger all rolled into one. Probably the remnant of a pagan goddess, by the time of the Middle Ages, she appears as a dangerous, old hag, who, depending on the tale, is either an utterly malevolent witch, or a benevolent wise-woman. Here are two stories, one for each view of the "Little Grandmother." In the first story, there was once a man whose wife died and left him with a young daughter named Lubachka. Lubachka's father loved her dearly, but was a merchant, and often traveled abroad. On one such journey, he met a handsome woman, and married her, hoping she would be like a second mother to his daughter. As is usually the way with step mothers in these stories, the new wife was nice to the girl when her father was around, but secretly hated her and mistreated her when he was gone. Finally, deciding to be rid of the girl once and for all, she ordered Lubachka to go into the woods to visit her [the stepmother's] sister, and as for a special needle she would use to sew Lubachka a shirt. This all seemed fishy to Lubachka, so she agreed to go, but first went to see her real aunt, her dead mother's sister. This aunt told her that the girl was being sent to see Baba Yaga, a horrible witch that ate children. Since she had promised to go, she must go, but her aunt would give her everything she needed to survive. So saying she gave her niece a red ribbon, a bottle of sunflower oil, a loaf of fresh bread, and a piece of ham. Then Lubachka set off into the woods. Eventually, she came to Baba Yaga's house, a peasant hut that danced on top of two giant chicken legs. Around the house was a picket fence made of human bones, and on top of each picket was a human skull. Lubachka approached the house and it stopped dancing to let her in. Inside, she saw the old hag weaving at a loom, as terrible as her aunt had told her she would be. She told the hag why she had come, and Baba Yaga smiled, showing her iron teeth, and said she would go fetch the needle at once. A large cat sat in front of the girl to keep an eye on her, and in the meanwhile, Baba Yaga had her maid prepare a bath for Lubachka so she would be nice and clean when the hag decided to eat her. Hearing this, Lubachka knew she had to act fast. She bribed the maid to put the fire under the water out by giving her a kerchief. Bribing the cat with her aunt's ham, Lubachka found out that the hag's comb and blanket were magical and could help her escape. Grabbing them up, she fled the hut, and when the dogs came after her, she threw them the fresh baked bread, and they let her pass. As she reached the gate, it started to swing shut, but the girl oiled its hinges, and it swung back open. Finally, the birch trees by the gate tried to grab her with their branches, but Lubachka used her aunt's ribbon to tie them together. Now, when Baba Yaga came back to check on the girl, she saw she had fled. She accused the cat of betraying her, but the cat replied that in all the years he had lived with the hag, she had never given him so much as a bone, while Lubachka had given him a piece of ham. Baba Yaga ran into the yard and saw the dogs contentedly eating the bread, and began to scold them, but they replied in much the same way as the cat had. So it was with the gate, the birch, and the maid, as well. Baba Yaga had only scolded or abused them, but Lubachka had given them gifts, so they let her pass. Baba Yaga began to chase after the girl herself, but Lubachka threw down the towel, and it turned into a wide river the witch could not cross. The hag returned with her oxen, who drank the river dry, and then she again gave chase. This time, Lubachka threw down the comb, and it turned into a thick forest; so thick that even Baba Yaga's iron teeth could not chew through it. Defeated, the witch remained home. When the girl reached home, she found that her father had just returned and was sitting down to dinner. Frantically, Lubachka told him everything that had happened, and her father grew furious. He chased his wife into the woods, where the wolves tore her to shreds. Then he and Lubachka lived together happily ever after. There lived an old man and woman, who had three daughters. The youngest was lovely beyond belief, and as her father's favorite. One day, the old man was going to the fair and asked his daughters what they wanted him to bring back as presents. The eldest wanted a new dress, the middle girl a new shawl, but the youngest only wanted a red flower. The old man thought this was strange and silly, but his daughter insisted, so at last he agreed and set out for the fair. He easily found the dress and shawl, but could not find a red flower. Only as he was going home did he see a traveler who had a red flower in his hand. The old man offered to buy it, but the stranger refused to sell the flower. However, if the old man's youngest daughter would marry the stranger's son, Bright Finist the Falcon, then he would give the man the flower as a gift. The old man did not like this arrangement, but he figured his daughter could always refuse, so he agreed to the deal, and took the flower home with him. When he gave his daughter the flower, he told her about the stranger, and the deal he had made in order to get the flower. To his surprise, his daughter laughed and smiled, telling her father that Bright Finist was a great hero who could fly in the shape of a falcon. She had met him at Mass, and learned that he was deeply in love with her. Not knowing what to make of all of this, her father sent her to bed, saying they would discuss this in the morning. That night, the young woman opened her windows, and a falcon flew in through the open window, and transformed into a young man. They talked until dawn, and then the young lord kissed the girl and told her he would return each night to see. In the meanwhile, he gave her one of his feathers, and told her that should she wish for anything, she should go to the balcony, wave the feather to the right, and whatever she wished for would appear. This went on for days, and Bright Finist always appeared each night. But one night, the young maiden's sisters became suspicious when their sister appeared with fine new clothes and lovely jewels. They spied on her, and grew jealous of her evening visitor. So one night, as the young girl slept, the older sisters but knives in the widow, so the falcon would cut his wings as he came to visit. When this happened, Bright Finist thought the lady no longer loved him, and flew away, not to be seen again. The girl eventually set out to find her love, and wandered into the forest. Here she came to a hut, and inside was a Baba Yaga [the hag is represented as three sisters in this story]. The girl told the hag her story, and the witch gave her a golden hammer and ten diamond nails. She told the maiden that when she came to the sea, Bright Finist's new bride would try to buy the hammer and nails. She should accept no payment, but instead ask to see Finist the Falcon. The Baba Yaga then sent the girl to her second sister for advice. The girl travels to see the second witch, who gives her additional gifts, and similar advice, telling her to go and see the third Baba Yaga. This Baba Yaga already knew that Bright Finist had married a Tsar's daughter, and gave her a magic steed that would carry her at once to his palace. Sure enough, at the palace, the young girl was approached by Finist's bride, who desired her treasures. The girl offered to trade them for a chance to see her love, and the princess agreed. Only the Tsar's daughter was treacherous, and bewitched Finist with a magic pin, so that he would not awake. Each day the girl traded away one of her gifts, and each day she proved unable to awake her lord. Finally, on the third day, after she had traded her magic steed, the girl went to see Bright Finist the Falcon, and as she held him, the pin fell out. He awoke at once, and the girl told him the entire story of what had happened. Bright Finist called together all of the princes and nobles and asked their judgment. Should he be forced to remain with the wife who had sold him, or should he be allowed to marry the lady who had bought him? The people declared that he should take the woman who had bought him, and that the one who had sold him should be hung on the gate and shot. Bright Finist of the Flowery Feathers did this. Once there was a Tzar named Svaitozar, and he had two sons and a daughter of unearthly beauty. Yet none but the royal family had ever seen her face. This beauty was called Vassilissa Golden Tress. So that no harm might come to her, this Vassilissa was never allowed to leave her chambers, and all of the finery of the Tzar's court was tedious to her. Still, though none had seen her, her fame was such that princes from all over the world came seeking her hand in marriage. Knowing that her father would soon marry her to some Tzar or other, Vassilissa asked that she might be allowed to walk freely through the palace and its gardens, at least once. Tzar Svaitozar agreed, and his daughter went out into the courtyard. She was so excited by her new freedom, that she forgot to don her veil, and as soon as she stepped outside, a whirlwind swept out of the sky, and carried her off! She was carried through three kingdoms and into the fourth, the land of the Savage Serpent [a winged giant with the head of a snake]. There she was imprisoned in a castle of gold, that stood upon a pillar of silver, and was surrounded by curtains of diamond. Meanwhile, Vassilissa's brothers set out to find their sister. They traveled through all three kingdoms, and at last came to the land of the Savage Serpent. They snuck into the castle, and soon found their sister, but before they could leave, the Serpent returned. In one blow, he slew both brothers, and had his guards toss their bodies into a ditch. Realizing that further help would probably not be forthcoming, Vassilissa tried to trick the Savage Serpent into revealing his weakness. The Serpent told her that only a hero named Ivan Goroh [John Pea] was fated to defeat him, but he did not mean it. He had made it up as a jest to tease the princess. But prophecies have a strange way of coming true, and so it was with Ivan Goroh. Through a rather strange set of circumstances, Vassilissa's mother came upon a magic stream drank some of its waters to wash down a pea. The pea grew, and eventually the Tzarista gave birth to a son they name.....Ivan Goroh. Ivan Goroh was not like other children, an hour was like a year, and he grew stronger and stronger, so that by the time he was ten, he was the greatest of all champions. It was then he heard about the whirlwind that had borne away his sister and slew his brothers, and he set out at once to rescue them. In the forest, Ivan came upon a chicken-legged hut and met a strange hag [guess who], who was willing to tell him how to find the whirlwind if he would swear to bring her water from the fountain of youth that flowed in the Serpent's castle. Ivan promised and thus passed through the three kingdoms, and at last into the fourth, that of the Savage Serpent. When he arrived at the castle, the Serpent was not there, so Ivan made himself at home, drinking three gallons of mead, and sitting in the Serpent's own chair. The chair cracked under his weight, and the youth laughed and told his sister that he had no fears of the monster, for he was greater in size and power. From there, he found the Serpent's smith, and made him forge him an iron club that fifty men could not lift, but which Ivan Goroh could toss with one hand. Now the Savage Serpent came, riding the whirlwind, and breathing fire. He and Ivan Goroh went to battle, and there was a great fight. Yet when Ivan at last landed a blow on the Serpent, the monster shattered to pieces, and the club broken. The people cheered and proclaimed Ivan as Tzar, but Ivan insisted that the crown should go to the smith, as a reward for making the club. He also took the waters of life and death from the Serpent's castle, and brought his brother's corpses back to life. Finally, he let the old hag bathe in the fountain of youth, and she became a beautiful maid who showed him the way home. Ivan Goroh, Vassilissa, and their brothers at last came home, and there was great rejoicing. All married, and in time, Ivan Goroh became Tzar after his father, and ruled the land well and wisely. And of course, for all of them....they lived happily ever after.